My garden and I have learned that water-thirsty plants are not going to survive. My interest in low-water-use plants grew out of self-defense. Even though most of the gardens that I design for others have irrigation systems, my garden does not. I have a puritan streak in me that doesn't want water spraying extravagantly, and I just don't spend a lot of time watering with a hose. My garden and I have learned that water-thirsty plants are not going to survive. 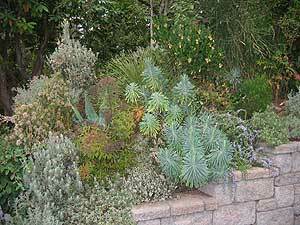 In a well-drained sunny spot, this dense planting includes: (from left to right) Cassinia leptophylla, Agave americana, Spiraea, Dasylirion longissima, Euphorbia, Arbutus unedo 'Elfin King' and Rosmarinus officinalis 'Prostratus'. Seen in silhouette against the sky, the tropical foliage of Toona sinensis plays off against the denser outline of Cupressus arizonica. Ah, but the plants that have taken hold and thrived. The icy blue foliage of an Arizona cypress (Cupressus arizonica) has grown from a gallon pot to a 30-foot tree in a dozen years. A bay laurel (Laurus nobilis), which as a tiny plant survived the freeze of 1991 by hiding under the snow, now stretches 25 feet into the sky. 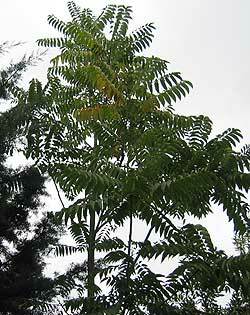 A real surprise is Toona sinensis, which shot up to 25 feet in eight years, with tropical looking pinnately-compound leaves. Weaving through other shrubs, Elaeagnus x ebbingei 'Gilt Edge' shines with green leaves edged in yellow. Other shrubs have also grown well with little summer water, including many with evergreen leaves. Loquat (Eriobotrya japonica) offers tropical foliage. The grandest of all mahonias, Mahonia x ‘Arthur Menzies', starts blooming in December in the softest of yellows. Azara microphylla brings in fine texture and has grown to 15 feet in as many years. Pineapple guava (Feijoa sellowiana) has proven hardy and use little water, growing into a handsome, small tree. The long hanging catkins of Garrya elliptica celebrate each year the coming of the winter. I wouldn't want to do without the tree anemone (Carpenteria californica)—its white flowers with cheerful yellow centers stand out on the dark evergreen leaves. Columnar yew (Taxus baccata ‘Fastigiata') provides upright, deep green accents, and the silver bark of Eucalyptus pauciflora ssp. niphophila shimmers all year long. My winter bloomer, Viburnum x bodnantense ‘Dawn', flowers fragrantly from November through February on bare stems, and sometimes blooms again in late summer. Another scented winter flower, wintersweet, (Chimonanthus praecox) stands far from the hose bib and is perfectly happy. Elderberries (Sambucus), another low-water-use deciduous shrub, come in a range of species and cultivars. Sambucus nigra ‘Aureomarginata' does very well in full shade, lighting up dark corners with its variegated green and cream leaves. The delicate cut-leaf foliage of Sambucus nigra ‘Laciniata' contrasts well with bold-leaf plants, such as Fatsia japonica. The wild jungle foliage of yellow tree peony (Paeonia lutea var. ludlowii) grows to ten feet and eight feet wide. Yellow groove bamboo (Phyllostachys aureosulcata), planted four years ago in two places in my garden for selective screening, has not spread out of control, a benefit of watering sparingly; the bamboo stays put. The trees and shrubs have grown tall and created a shade garden, so now I am looking for plants that will carpet the ground in the sunless understory. Epimediums are indispensable. Epimedium pinnatum colchicum has evergreen foliage to 16 inches as well as yellow flowers in the spring, and needs no additional summer water in the shade. Other epimediums have deciduous foliage. In the same family, Berberidaceae, consider our native low Oregon grape (Mahonia nervosa), which grows to two feet tall. Also from this family comes inside-out flower (Vancouveria), a delicate Northwest native with both deciduous and evergreen species. Looking for a place for a few sunny plants, I cut down a prickly holly, probably planted by a bird fifty years ago. This spot on top of a rockery provides good drainage for low shrubs and perennials. The long-blooming, silver leafed Cassinia echoes the gray hues of lavender and the silver cast of Dorycnium hirsutum foliage. Joining the mix are euphorbia and sunroses (Helianthemum). A dwarf strawberry tree (Arbutus unedo ‘Elfin King') adds fall bloom. Fall is the best time to plant. I have not given up on thirsty plants. When I see one that I have to have and know that it wouldn't survive on tough love, I put it in a container for coddling. I have a collection of large-leafed plants in pots lining a walkway, including the gigantic platters of Astilboides tabularis and the glossy, kidney-shaped foliage of Farfugium japonicum ‘Giganteum'. Fall is the best time to put in low-water-use plants. The soil is still warm and the returning rain soaks in, encouraging root growth. Many of these plants you can find at a nursery near you, or even closer, on your computer screen. Phil Wood owns and operates Phil Wood Garden Design. 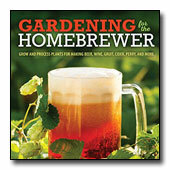 He writes about garden design for the Seattle Times newspaper, appearing every other Saturday in the DIGS section. Over the years, Phil designed ten gardens for the , winning many gold medals. He earned his Bachelor of Landscape Architecture from the University of Washington and a Bachelor of Fine Arts in Sculpture from Cornish College of the Arts.